3D Drill file, the original data file in Pyware 3D. 3D Drill Package file which is a combination of a 3D Drill file and its external files. External files consist of audio files, prop images, floor covers, fabrics, surfaces and grounds. 3D Production files which are a collection of 3D Drill Packages. When Drill Packages are combined, they make an entire show (production). New Drill is used to create a new drill file or continue an existing drill from another file. 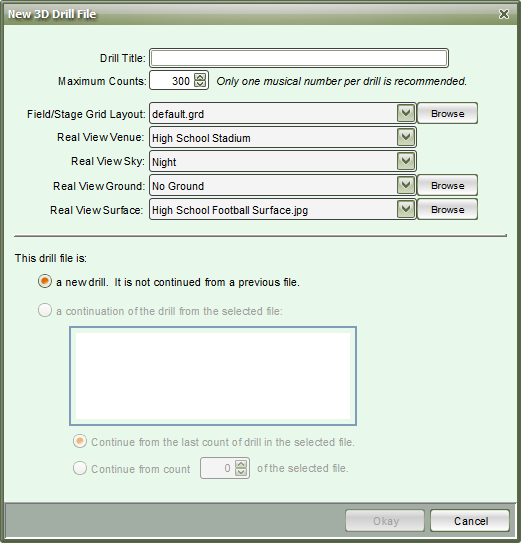 Selecting New Drill from the File menu will display the New Drill File dialog. Drill Title is the title of the drill as it appears on printouts and in productions. Field/Stage Grid Layout is the type of grid that is used for the design and performance surface. Clicking Browse will display the list of available fields. You can create your own grid layouts from the Grid Designer found in the Utilities menu. Maximum Counts is the number of counts in the new drill file. Real View Venue will add an environment setting, such as a stadium, gymnasium, or parade route to the Real View window. Real View Sky option has various skies to choose from to enhance the Real View scenery. Real View Ground will replace the ground surface and surrounding field areas with whichever option you choose. When loading a Ground, we recommend choosing a surface file as well, such as a High School Football Field. Real View Surface allows you to import a performance surface to overlay on the field. This aids with customization of the performance surface, as you could use images that represent tarps, football fields, basketball courts, etc. *We recommend that you create separate files of major segments of the show or each musical selection. This will make writing and teaching the drill much more manageable. 3D will allow you to copy the last set of one drill in a file and paste it to a new file as the first set.